When businesses, professionals or individuals enter into contracts, it is not uncommon for one party to fail to meet its obligations under the contract. Contracts create certain obligations on each party, and when one party fails to fulfill its obligation, this is considered a breach of contract. 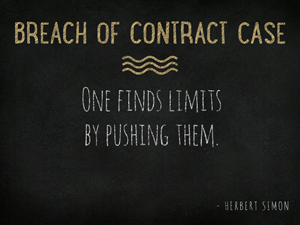 A breach of contract case can arise under many circumstances. For example, when a party fails to perform in a timely manner or fails to perform in accordance with the specific terms of the contract. Other times, a party will fail to perform at all. In these situations, a breach of contract lawsuit will likely be filed. Once it is determined that the parties have entered into a contract and that the contract has been breached, what happens next? Our Chicago breach of contract attorneys are experienced in prosecuting and defending breach of contract lawsuits. What happens after a contract is breached? If one party breaches the contract (defendant) the other party (plaintiff) may seek to have the contract enforced and to recover for any damages caused by the breach. The following are the typical steps and phases involved in a breach of contract case. The first step is to determine the proper parties. The defendant is the breaching party. The plaintiff is the party to the contract that was damaged by defendant’s breach. The plaintiff is responsible for filing a lawsuit to enforce its rights. A proper party can be an individual and or a business. There can be more than one plaintiff and/or defendant in any given lawsuit. Once the proper parties have been identified, it is important to determine where the breach of contract lawsuit should be filed. If the contract does not provide where a dispute should be filed, the place of performance, where the defendant is located or where the contract was negotiated and/or executed should be considered. A breach of contract complaint must be drafted, conforming with the requirements in your jurisdiction. Be sure to contact a breach of contract lawyer if you are not familiar with the requirements for filing a breach of contract complaint in your jurisdiction. Failure to comply with the local requirements could result in dismissal of your breach of contract case. After the breach of contract complaint is filed, the defendant must be properly served with the complaint. The local sheriff or a process server must obtain personal service of the compliant on the breach of contract defendant. After the defendant is served with the complaint, depending on the jurisdiction, there will be a specific amount of time in which an answer and/or appearance must be filed on behalf of the defendant. In response to the breach of contract complaint, the defendant could file an answer or a dispositive motion. For an answer, the defendant will either admit or deny each of the allegations in the complaint. For a dispositive motion, such as a motion to dismiss, a defendant will argue specific reasons why the complaint should be dismissed. In Illinois, the most common types of motions to dismiss are motions to dismiss under 735 ILCS 5/2-615 and 735 ILCS 5/2-619. A Section 2-615 motion to dismiss will set forth defects on the face of the complaint that make dismissal appropriate. For example, failing to state a claim or failing to plead all of the elements of a breach of contract claim would be grounds for dismissal under 735 ILCS 5/2-615. Section 2-615 motions to dismiss only attack defects on the face of the complaint or “within the four corners” of the complaint. A Section 2-619 motion to dismiss are different from a 2-615 motion to dismiss. A Section 2-619 motion to dismiss go beyond the “four corners of the complaint” and assert affirmative reasons for dismissal. For example: (1) the court lacks jurisdiction, (2) plaintiff does not have legal capacity to sue or defendant does not have legal capacity to be sued, (3) another action is pending between the same parties for the same cause, (4) the cause of action is barred by a prior judgment, (5) the action was not timely filed, (6) the claim has been released, satisfied or discharged in bankruptcy, (7) the claim is unenforceable under the Statute of Frauds, (8) the claim is unenforceable because of defendant’s minority or other disability, and (9) the claim is barred by other affirmative matter avoiding the legal effect of or defeating the claim. See 735 ILCS 5/2-619(a)(1-9). If the case is dismissed based on one of the aforementioned dispositive motions, the court could dismiss “with prejudice” or “without prejudice.” If the case is dismissed with prejudice, the plaintiff will not be able to re-file in an attempt to state a proper claim. If the case is dismissed without prejudice and with leave to re-file, the plaintiff will be given time to file an amended complaint. A defendant to a breach of contract case might also file affirmative defenses and/or counterclaims in response to the breach of contract complaint. Both of these responsive pleadings will require the plaintiff to take action to respond to and/or answer defendant’s pleadings. Keep in mind that in filing a complaint as a plaintiff, one might also be required to defend potential claims brought by the defendant in response to plaintiff’s complaint. After the responsive phase of the breach of contract case comes the “discovery” phase. The discovery phase of breach of contract litigation (or any type of litigation) can often be the most expensive and time-consuming part of the case. During discovery, the parties request and exchange documents and other case-specific information. The parties will serve requests for production, interrogatories and requests for admission of fact. The parties will also have to determine what witnesses will be required and serve deposition notices (on parties) and subpoenas (on non-parties) to obtain other oral and written information. The discovery phase helps the parties to obtain information that they would otherwise not have access to. For example, communications documents to which one of the parties was not privy. Discovery also helps the parties to determine additional strengths and weaknesses of their case, to assess damages and other risks, and to obtain and determine what documents to use and witnesses to call at trial. After the close of discovery in a breach of contract case, the judge will likely set the case for trial. The trial could be a jury trial or a bench trial. A bench trial is a trial without a jury, in which the judge decides the outcome of the case. Either way, each party will be required to properly present evidence in court, following the Illinois (or applicable) rules of evidence. Evidence not properly admitted will be stricken from the record. After a decision is reached by the judge or jury, either party could appeal the decision in the appellate court, which could extend the case even longer. Some contracts contain arbitration and/or mediation provisions that require disputes to be resolved before an arbitrator or mediator, rather than in court. This is called “alternative dispute resolution.” Alternative dispute resolution can often be faster and less expensive than litigation in court, but not always. Contact our Chicago business lawyers to determine your rights and options regarding your breach of contract case. As always, our litigation attorneys stand ready to consult and assist. Additionally, our litigation attorneys will do their best to advise you and or your business regarding the best strategy for your breach of contract case. This includes attempting to negotiate a settlement and, if necessary, litigating, arbitrating or mediating your breach of contract case. Breach of contract cases involve a number of different aspects and stages, such as proving the appropriate elements, damages and defenses. As always, our litigation attorneys stand ready to consult and assist. You are not alone. Litigating disputes can be difficult, but we are here to help. Our Chicago business litigation and breach of contract attorneys can assist you with the prosecution or defense of your breach of contract case. We have experience in handling cases in state and federal courts throughout Illinois, including Cook, DuPage, Kane and Will Counties. For additional information about our breach of contract lawyers and to discuss your breach of contract case, please contact one of our Chicago law firm at 312-789-5676. You can also contact us by email or by providing your information in the sidebar to inquire about your case.